Now your astigmatic patients can enjoy all the convenience of a daily disposable and the healthy advantages of silicone hydrogel in one lens—clariti® 1 day toric from CooperVision. Winner of the Contact Lens Product of the Year at the 2012 Optician Awards**, clariti 1 day toric is the only silicone hydrogel, daily disposable contact lens for astigmatism available today. For your patients, silicone hydrogel means whiter eyes and a healthier*** lens-wearing experience. The clariti 1 day lens provides more than the recommended amount of oxygen***** across the entire lens surface to help maintain ocular health. 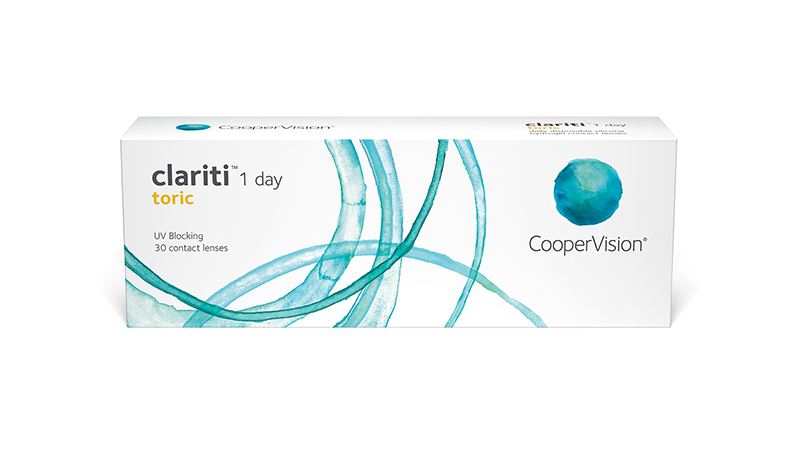 CooperVision clariti 1 day toric is a hydrophilic lens with optimal wettability. The lens naturally attracts and binds water molecules, holding them tightly to the lens surface. AquaGen also provides continuous wettability throughout the wearing time. The result is a lens with high water content****** that provides excellent all-day comfort for your patients. ***Data on file; clariti 1 day offers whiter eyes than 1-DAY ACUVUE® MOIST®.